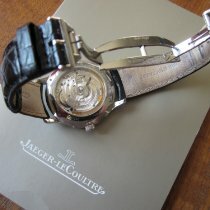 The Swiss luxury watch manufacturer Jaeger-LeCoultre is known worldwide for exquisite wristwatches. They offer timepieces ranging from incredibly thin dress watches to intricate watches with a minute repeater, perpetual calendar, or tourbillon. There are few Swiss watch manufacturers who have created as many watchmaking innovations as Jaeger-LeCoultre. The Swiss manufacturer from Le Sentier in the Vallée de Joux has mastered the greatest technological challenges of watchmaking, ranging from a two-level movement, the Duoplan, to the smallest movement in the world, the Calibre 101. They're also masters of complications such as the perpetual calendar and minute repeater. Jaeger-LeCoultre values traditional handwork, and their production proves it: over 90% of each timepiece is created in-house . When it comes to quality and perfection, this company is in a league with Audemars Piguet, A. Lange & Söhne, and Patek Philippe. 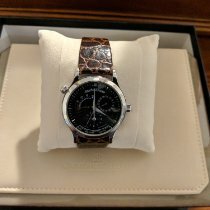 What are the most important models and their prices? Jaeger-LeCoultre mainly offers men's and women's dress watches with classic, elegant designs. The rectangular Reverso or thin Master Ultra Thin go particularly well with a business suit. If you're always busy and need appointment reminders to keep you on schedule, the Master Memovox would be a practical choice, as the timepiece has an alarm function. The Deep Sea or Master Compressor Diving timepieces appeal to fans of diving watches, and the sparkling, diamond-set Rendez-Vous collection was designed with women in mind. If you're searching for an intricate watch with a tourbillon, perpetual calendar, and minute repeater, then you will find the perfect timepiece in the Hybris Mechanica series, which includes prime examples of haute horlogerie. The Reverso is Jaeger-LeCoultre's most iconic watch. Its defining feature is its unique rectangular case which the wearer can completely flip to the reverse face. The Le Sentier-based manufacturer developed the wristwatch in the early 1930s for polo players, as they often complained of broken watch glass on their timepieces after matches. The reversible case was the solution: it protects the display from jolts and shocks. The first watches produced were not powered by in-house calibers, but rather by movements without a seconds hand from the manufacturer Tavannes. The Reverso's Art Deco design reflects the time in which it was created. The back side of the reversible case often features decorative engravings or enamel work, though there are also models with additional displays on the reverse face or a see-through reverse face. 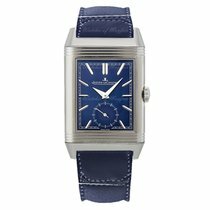 The Reverso is available as a men's or women's watch. Models with a cordovan leather strap made by the Argentinian shoe manufacturer Casa Fagliano are especially rare and highly sought after. The Buenos Aires-based company produces handmade polo boots and each year, they create around 100 straps for the Jaeger-LeCoultre Limited Edition Reverso Ultra-Thin. With an 18-karat pink gold case, this elusive model costs around 12,000 euros. There are cheaper options available, however, you can purchase a pre-owned stainless steel, quartz Lady Reverso in very good condition for around 2,000 euros. Prices for pre-owned men's quartz watches also begin at 2,000 euros. You can purchase a Reverso with a manual or automatic caliber starting at 2,500 euros. A new quartz Reverso is available starting at 3,000 euros; versions powered by mechanical movements cost at least 4,000 euros. Prices for pre-owned gold watches from this collection start at 4,500 euros. New gold watches are the most expensive options, costing around 10,000 euros. Watchmaking highlights from the Reverso series are the Grande Complication models in white gold or platinum featuring a tourbillon and perpetual calendar. They also display sidereal time, which deviates from our standard time by about four minutes and is based on the movement of the stars in the sky. You should be prepared to spend a significant amount on a Grande Complication, as these special Reverso timepieces cost around 340,000 euros. Jaeger-LeCoultre introduced the Master Control in 1992. The classic, round timepiece was the first timepiece from Jaeger-LeCoultre to undergo the company's own testing process. The Master Control watches have a streamlined design; the simple and clean dial makes this model perfect for everyday wear at the office. New models cost around 4,400 euros, while pre-owned stainless steel models in very good condition can be purchased starting at 2,600 euros. Many other Swiss watch manufacturers send their movements to the Official Swiss Chronometer Testing Institute (COSC) to have their precision certified. Jaeger-LeCoultre, however, tests each wristwatch for 1,000 hours in-house . Unlike the COSC test, the whole watch is tested, not just the caliber. Furthermore, the test checks the case's resistance to pressure, shock, and magnetic fields. The first versions of the Master Control were powered by the in-house caliber 889 with a date display, quick set-date, stop-seconds mechanism, and a bidirectionally winding rotor with a gold exterior. The simple Master Control models with a date display are powered by the automatic in-house caliber 899, which has a 38-hour power reserve. The quality and finishing of Jaeger-LeCoultre movements is of the highest standard. The Master Ultra Thin's design is a bit simpler than the Master Control with its thin hands and indices. The incredibly slim wristwatch is 7.5 mm thin and modeled after a minimalistic pocket watch from 1907. The Ultra Thin 41, lacking a second hand and date display, is well suited for purists. There are also versions available with a central seconds hand and date window at six o'clock, small seconds, moon phase display and date hand, power reserve display, tourbillon, or perpetual calendar. You have the choice of a stainless steel or 18-karat pink gold case. New timepieces cost at least 5,000 euros, while pre-owned versions of the Master Ultra Thin are available starting at 3,500 euros. If you want a perpetual calendar, then you should plan on spending around 14,000 euros for a new Master Ultra Thin Perpetual. 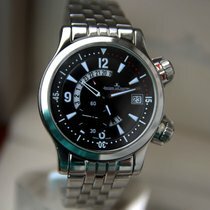 The models in the Master Compressor series are robust sports watches named for their so-called compression key system. This is an alternative to the usual screw-down crown. A half turn of the compression key allows you to pull out or push down the crown. A traditional screw-down crown must be turned counterclockwise multiple times before you can pull it out to set the watch. A further benefit of the compression key system is that when it's closed, it completely seals the case by putting pressure on an internal cone. A new Master Compressor costs around 8,000 euros; versions with a ceramic case and stopwatch function cost around 10,000 euros. However, you can purchase pre-owned models for as low as 3,000 euros. Pre-owned chronograph Master Compressors cost a bit more at around 4,000 euros. The Atmos clock has been part of Jaeger-LeCoultre's offerings since 1928. 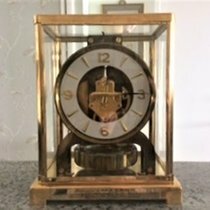 This unique clock was invented by Jean-Léon Reutter. Even the most minute temperature changes power the atmospheric clock. A change of just one degree will power the clock for 48 hours. The hermetically sealed clock contains a gas mixture which expands with rising temperatures and contracts with sinking temperatures. Prices for a new Atmos start at 4,500 euros while top-line limited edition models cost over 140,000 euros. You can purchase a pre-owned clock made of gold-plated brass for just 1,500 euros. The Geophysic has been around for almost 60 years. Jaeger-LeCoultre presented it for the first time in 1958 in conjunction with the International Geophysical Year, an international scientific project. Today, the Geophysic is available as a simple three-hand watch with a date display, world time function, or tourbillon. The timepiece is available with a stainless steel, 18-karat pink gold, or platinum case. One special feature of this timepiece is its true seconds function. Unlike most mechanical watches, the second hand does not move smoothly, but rather in one-second jumps similar to a quartz watch. The Universal Time models have a lacquered sunburst world map on the dial with a rotatable disk on the outer edge featuring 24 city names. Each city represents a different time zone so you can quickly read the time in different parts of the world. New stainless steel versions of the Geophysic with a world time function cost at least 10,000 euros, while pink gold versions cost around 20,000 euros. You can purchase a new pink gold Geophysic Date with three-hands and a date display for around 12,000 euros. If you prefer a stainless steel version, you should be prepared to spend around 6,500 euros. Whoever wears a Jaeger-LeCoultre shows they respect tradition and fine in-house calibers; the high-quality workmanship of the timepieces is important to fans of this brand. The most famous JLC wearer is Queen Elizabeth II, who wore a diamond-set timepiece with the incredibly tiny LeCoultre Calibre 101 at her coronation in 1953. Actor Robert Downey, Jr., known for his role as Tony Stark in the Iron Man and Avengers films, is also a fan of Jaeger-LeCoultre watches. He owns an Amnox3 Tourbillon GMT with a see-through case back. The star also has many Rolexes, an Omega Speedmaster Professional Moonwatch, and a Nautilus from Patek Philippe in his collection, among others. Several Jaeger-LeCoultre watches have made it to the big screen. The millionaire Bruce Wayne, also known as Batman, wears a rectangular Reverso Grande Date in The Dark Knight Rises film (2012) starring Christian Bale. In celebration of the film's release, Jaeger-LeCoultre released a limited edition Grande Reverso Ultra Thin 1931. Another Jaeger-LeCoultre watch makes an appearance on the wrist of Dr. Stephen Strange, played by Benedict Cumberbatch, in the film adaptation of the Marvel comic, Doctor Strange (2016). Dr. Strange wears a classic Master Ultra Thin Perpetual with a perpetual calendar and personalized engraving on the case back. Jaeger-LeCoultre's history began over 180 years ago. Brothers Charles-Antoine and Ulysse LeCoultre founded their workshop in 1833. At first they simply finished gear wheels, however, soon after the company's founding in 1844, they created a precise measuring instrument for producing wheels. The "Millionometer" could measure one-millionth of a meter, known as a micrometer. The tool became a foundation of precision watchmaking. LeCoultre produced countless pocket watches and movements. Even other highly respected Swiss watchmakers, such as Patek Philippe, valued the quality of these movements and frequently used them in their own timepieces. LeCoultre also mastered a myriad of complications over the years. The ébauche manufacturer LeCoultre began working with the French watchmaker Edmond Jaeger at the beginning of the 20th century. It was the beginning of a partnership that eventually became a merger in 1937. VDO, a German tachometer producer, acquired 60% of Jaeger-LeCoultre SA stock in 1978, while Audemars Piguet acquired the other 40%. The company has been part of the Richemont Group since 2000 . Other watch brands such as A. Lange & Söhne, IWC, Panerai, and Vacheron Constantin are also a part of the Richemont Group.